There’s a cute, and false, urban legend that Eskimos have over twenty words for snow. While, as it happens, many of the words describe other forms of precipitation (for which we, too, have other words), the idea behind the legend is still useful: the more familiar we are with something, the closer we get to it, and the finer the distinctions we are able to perceive. What’s more, if we suppose a hypothetical Inuit who really does have twenty words for snow, the experience she has of “snow” is actually quite different from ours. She perceives changes in kind where we only note gradations of intensity. She experiences several phenomena where we might only experience one or two. Language shapes our experience of reality. Imagine an emotional life without concepts such as despair, elation, and ambivalence — similar to, but notably different from mere sadness, joy, and uncertainty. As our emotional vocabulary grows — to include, say, ennui, schadenfreude, “processing” — so too does our attentiveness to the detail of our emotional lives. This, indeed, is one of the fruits of theosophical Kabbalah: that its intricate emotional and intellectual symbolism provides a rich texture for introspection. In a way, all the Sefer Yetzirah is doing is reading the book of Genesis very closely. Usually, when we read the creation account at the beginning of the Torah, we take it somewhat for granted. God says “Let there be light,” and there’s light. The Sefer Yetzirah, however, hones in on the “says.” It observes that God’s “speaking” is the way in which God creates. We are not completely sure, but many scholars believe the magic word “Abracadabra” derives from the Aramaic Avrah KaDabra, meaning “I create as I speak.” If this etymology is correct, Abracadabra really is a magic word; it is a performative speech act, just like the ten utterances of creation in the Genesis account. 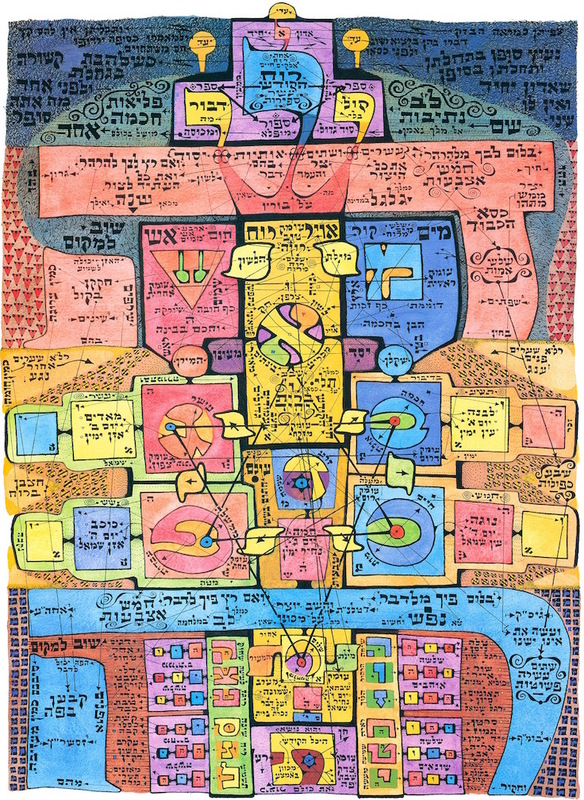 The Sefer Yetzirah is a map of all of creation — or better yet, a chart. There are no coincidences, but rather correspondences. Aleph, mem, and shin — the three “mother letters” — correspond to “breath, water, and fire,” which together with Earth, out of which Genesis says human beings (human: adam, earth: adamah) are created, form life. The seven Hebrew letters which have different sounds depending on context parallel the six ribs plus the heart. We could spend many hours probing the mysteries of this ancient book — not least, who wrote it and when; we know it dates back to the third century C.E., making it one of the oldest books of its type in the world; then again, we’re not really even sure what type of book it is. Hopefully, pages will be added to this site in the future which will do exactly that. For our purposes, though, the Sefer Yetzirah is most important as a foundation text. It shows that language creates, and that God works by permuting letters one with another. Implicitly, so can we. In the prophetic Kabbalah, the permuting of letters according to the Sefer Yetzirah and other texts is one of the core meditative practices. seven stones build 5040 houses. From there on go out and calculate that which the mouth cannot speak and the ear cannot hear. I sometimes analogize the letters, in this form of Kabbalah, to the elements of the periodic table — another very small set of core elements from which the entire universe is created by combination and permutation. That is exactly how they function in the Kabbalah, except for the fact that language, unlike hydrogen and carbon, can be observed directly, manipulated, and used in fascinating meditation practices to boggle the mind and open ourselves up to our deepest Selves.